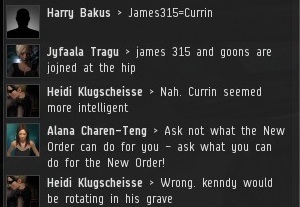 Previously, on MinerBumping... A highsec corporation called To The Stars became obsessed with me and the New Order. They committed the corp to my destruction, but ran into trouble when they couldn't figure out a way they could actually do anything. To The Stars pilot Smoke Break complained about my leadership qualities. The Hitler comparison was no surprise, but his addition of Idi Amin and Pol Pot adds fresh names to the endless list of comparisons. If I died, people would feel bad about it. But guilty? I don't see why. Most Agents are proud that they have the courage to stand up for what they believe in. 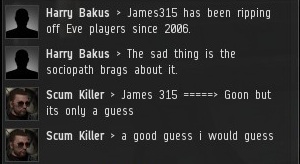 Immediately after condemning "paraniod [sic] narcissistic mother fuckers", Smoke wrongly accuses a random new player of being New Order. When bullets and bombs fail, there's always smacktalk. 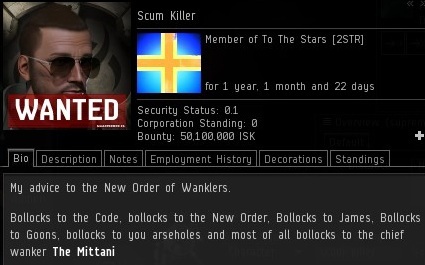 Unable to kill our bumpers or thwart our gankers, Scum Killer put his best weapons to use: Updating his bio and the corp description with insults about the New Order. A motley crew of rebels gathered together in Kamio. For some reason, Rokmal Serala followed us from Tolle to Kamio. At first, the ragtag resistance fighters were disorganized and ill-trained. But in time, the rebels would combine to become a powerful... Nah, nothing happened. You already knew that. Scum's idea of an intel channel showed promise. Why save the tears for local chat when you can influence far fewer people with your own channel? Scum boldly updated his bio with the same rant he had graced local with earlier in the day. The Mittani, despite not being in system or logging into EVE for who knows how long, ended up in the crosshairs. The bio attack proved ineffective, as probably two or three people read it before I posted it on this blog. I don't think this is what is meant when people say "bioweapon"! Meanwhile, Jyfaala Tragu joined anyone who would listen in Kamio local to probe the New Order conspiracy. 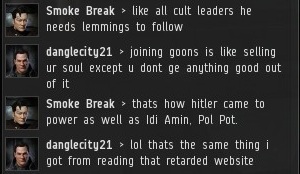 Scum theorized that I might have a connection to the Goons, but it was only guesswork. He could have gone from guesswork to looking at my employment history, but that would have taken several mouse-clicks. Bot-aspirants only do one or two of those per hour before they start to fade. I know what he meant, but "smooth toung" sounds disgusting. At last, Jyfaala completed the transition from "highsec corp CEO" to "that weird guy who mutters about Goons in local". In the end, To The Stars was unable to succeed in its mission of destroying the New Order, but they paved the way for future generations of rebels to also be unable to succeed in their mission of destroying the New Order. Who will be the next to pick up the torch? Think the comment came from my second visit in Kamio. 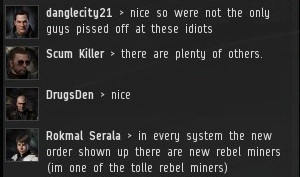 I came from Jita and watched for a while the local chat. I think i come for a third visit at the 24. no need to work/mine ice at this day. And maybe i can collect some new names for the future :). So see ya and happy holidays to all rebel miners, code compliant miners, agents and james if we dont meet us at the 24. Think its also no need for some fights or so. You've got to admire the sheer idiocy of those who define themselves by what they hate. Rokmal is making a list. Checking it twice. Gonna do nothing but mine some more ice. Rokmal Serala is coming to town! 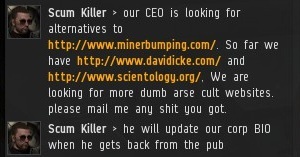 as a non-afk miner i feel that this minerbumping organization needs to be more widespread. where i live is infested with bot miners running full multibox with an orca and 3 hulks. i just eke out a living by waking up early when servers restart.